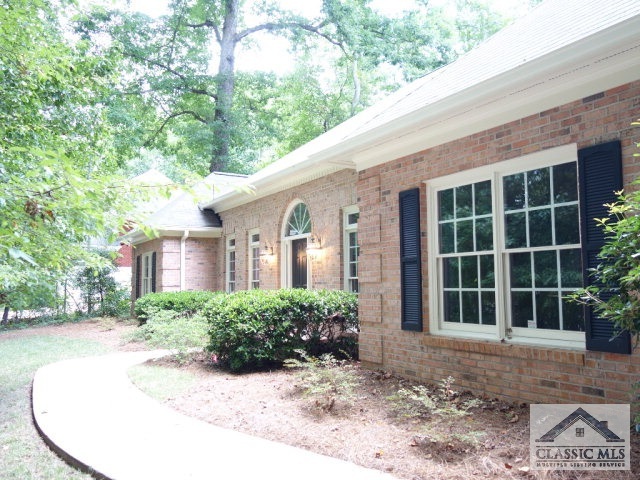 Exceptionally private, this 4BR/ 3BA upscale brick single-story Telfair home is located close to 316 with easy direct access to Athens and Atlanta. New shopping centers and restaurants minutes away and yet totally serene surrounded by green and trees. A lovely, airy foyer welcomes you and invites you into the vaulted Great Room with triple Palladium windows. To the right is the dining room with tall windows with lots of room for entertaining. Great Room is light-filled, has hardwood floors and a see-through fireplace to the kitchen. Kitchen is over-sized with an island, abundance of cabinets and separate eating area for breakfast. Off the kitchen is the laundry room, with cabinets and sink and access to the 2+ car garage. Nearby is a bedroom with en-suite bathroom- can be an office or separate guest quarters. Crossing over to the other wing, you'll find two bedrooms with their own vanities and Jack and Jill tiled commode/tub room. The master suite is expansive, with a windowed sitting area great for quiet reading or TV nook. Master bath has separate garden tub, shower and commode room and walk-in closet. French doors lead out to the patio from the Great Room and the Master Bedroom and is a great place to relax. An added bonus is that while there is lush grass, there isn't too much of it- so lawn care is minimal (there is a sprinkler system as well). Every window has views onto beautiful hardwood trees. Living here is so private and a part of nature, and yet so convenient for the rest of your life! New roof 2013. New gas furnace and cooling coil 2013. Rare find for those wanting class and convenience in one-level living. Telfair Place is a subdivision within the city of Athens, Georgia. There are currently 0 Homes for Sale within Telfair Place, with asking prices ranging from $0 to $0. The average list price per square foot of the available inventory in Telfair Place is $0, which is the Athens average of $218. The Average Sales price of all sold real estate in this subdivision for the past year is $323,833. Recent comparable homes have been selling for 97.86% of their asking price. Waterfront homes represent of the available Telfair Place inventory. The population of Athens, according to the 2010 Census, is 115,452. The total number of households in the zip code of Telfair Place is 16,955, with an average household size for of 2.33 people. The total number of renter households within the zip code of 30606 is 9,063, which means that 46.55% of households in this zipcode are owner occupant households. 295 Waterford Way, Athens GA 30606 is a Home, with 4 bedrooms which is recently sold, it has 2,916 sqft, .51-1 sized lot, and Attached,Garage,Kitchen parking. A comparable Other, has bedrooms and 0 baths, it was built in and is located at and for sale by its owner at $ 0. This home is located in the city of , in zip code , this County Other, it is in the Subdivision, and Bedgood Glenwood are nearby neighborhoods.